If your little one is currently on another brand of dairy-based infant milk and you’re wanting to switch to HiPP, the rule of thumb is to make the switch gradually. This is critical whenever moving from non-dairy to dairy (or vice versa), and it’s still a good practice even when your baby is already on a dairy formula. There are two good ways to do this. First, you can make transitional bottles, where you will mix some of the old formula, and some of the new formula. You’ll want to keep your ratios the same, so mix up a full bottle of your old formula with water, set it aside, and then mix up a full bottle of HiPP formula and set it aside. Once they are both ready made, take a 3rd bottle and add 3/4 old formula and 1/4 HiPP. Make 2-3 bottles with this ratio. After several feedings like this, you can move to 50/50 bottles for several feedings (half old formula, half HiPP), and finally, you’ll make several bottles that are 3/4 HiPP to 1/4 old formula. This is a very gentle way to transition your baby. Take your cues from your little one. 3-5 day of gradual transitional bottles will work well and if your baby is very sensitive or very young, you’ll want to do these bottles for about 7-10 days. Another way to transition your baby is by feeding. The concept is the same, that you are allowing your little baby to readjust to the new formula by slow integration. 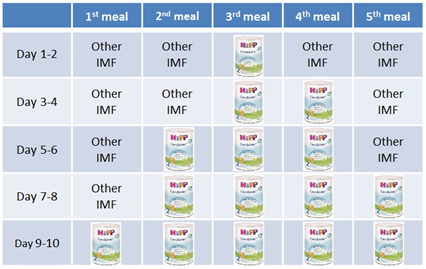 Below is a transitional feeding chart that will show you how to do this by feeding. Posted on July 13, 2015 by HiPP USA. "I have been mixing this with half breastmilk and half formula but my son chugs it down and doesn't seem to notice the difference."